The former Bicknell Manufacturing Co. complex off of Tillson Ave. in Rockland is being considered for redevelopment. If the conceptual plans a developer presented this week to the Rockland City Council come to life, a part of the city’s industrial waterfront will change dramatically. 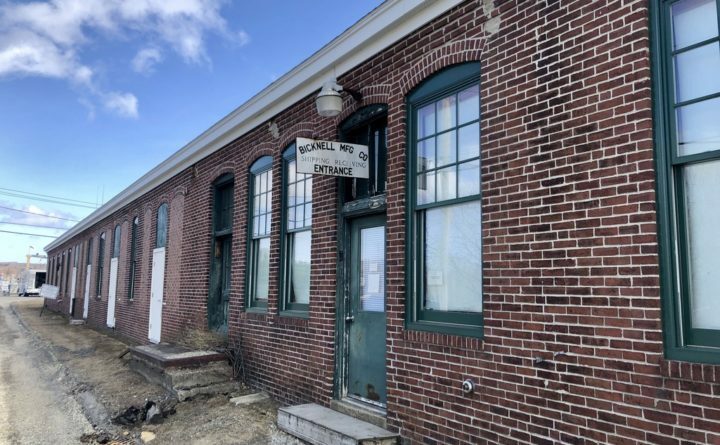 Valerie Landsburg of Rockland is planning to buy the former Bicknell Manufacturing Co. building near Tillson Avenue with plans to turn it — and surrounding buildings — into a large, mixed-use complex for public and private development. The 1.92-acre Bicknell property is not currently on the market, but Landsburg is working to purchase the property, according to her Realtor, Penney Read. Read could not disclose how far along her client is in the purchasing process. The property was previously listed for about $2 million, Read said. It is currently owned by Limerock LLC, which has several tenants in the buildings. If Landsburg was successful in purchasing the property, the tenants would likely be welcome to stay where they are, as the leasing revenue would bolster development of the rest of the property, Read said. Landsburg also wants to buy a smaller empty lot across the street from the Bicknell property that abuts inner Rockland harbor. Right now, Landsburg’s plans for the redevelopment are purely conceptual. In her meeting with city councilors, she insisted that what the space ultimately becomes would be reflective of the community’s wants and needs. Landsburg evisions the property having a mix of restaurants, shops and office space on the first two floors of the buildings — in keeping with how Main Street buildings are structured. On higher floors, Landsburg said she would like to create residential spaces. Event spaces and “makers’s spaces” would also be incorporated, she said. Public spaces would dot the complex, Landsburg said. They would be spots where anyone could sit and “enjoy the beauty” without having to “buy a cup of coffee from somewhere,” she said. “The goal I have is to build it for the community [that is here]. You don’t necessarily build it for the summer trade because we already have, and continue to have, what our summer visitors want,” Landsburg said. For more than a decade, city officials have been trying to entice development to the Tillson Avenue area. The neighborhood was home to workforce housing and industry, but now vacant lots and empty buildings predominate. Rockland’s U.S. Coast Guard base, DowDuPont’s seaweed processing plant, the city’s wastewater treatment plant and fish pier, as well as other industrial and waterfront businesses, are currently located on and around Tillson Avenue. City councilors were receptive of Landsburg’s plans to redevelop the Bicknell property. However Councilor Ben Dorr pointed out that in light of Rockland’s shortage of affordable housing, it would be ideal for any residential aspect of this property to be affordable to those who live in Rockland. The project is contingent on the completed sale of the building, but Read said work could be underway ― at least the planning phase ― in six months if the deal closes. Lansburg told city councilors that the project would be done in phases, with certain buildings on the property being renovated and rented before others to prevent “flooding the market” with available space. Landsburg said she is working with investors to advance the project. She has lived in Rockland year-round since 2013. Her family has been vacationing in the area for generations, she said, and her parents moved to the city full time 29 years ago.